• Give life to your testimonials – Use the real name, with photos, and specific details. Video testimonials are really effective too! Always make sure you have permission before posting a testimonial! • Focus on your target market – If you are an expert in one subdivision or sell mostly waterfront properties, promote testimonials that showcase this and are aimed at similar target markets! 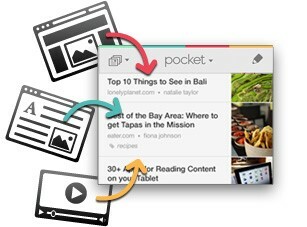 Pocket- Find something you want to read later, put it in your pocket! This app allows you to go to the site and mark the article you want to read by clicking on an icon on the tool bar. Save articles, videos, and images. It then syncs that information to your phone, tablet, and computer! Even works on Kindle Fire!